On Friday, November 11, the Crimson Storm women’s basketball team kick off their season against the University of Science & Arts of Oklahoma at 8:00p.m. in the Sawyer Center. Led by coach Derek Dorris and assistant coach Logan Martin, the team went 6-19 in the 2015-16 season but are hopeful for this year. I sat down with Rachel Doerneman (#42) , Abby Boyd (#5), Danielle Gaddis (#23), and Olivia Chapman (#4) — returning players — to hear how they felt about the season, some things to look forward to, and what it’s really like being a part of the Crimson Storm women’s basketball team. All the players seemed incredibly optimistic about this season, but also recognized the impact just being on the team has had on their own lives. 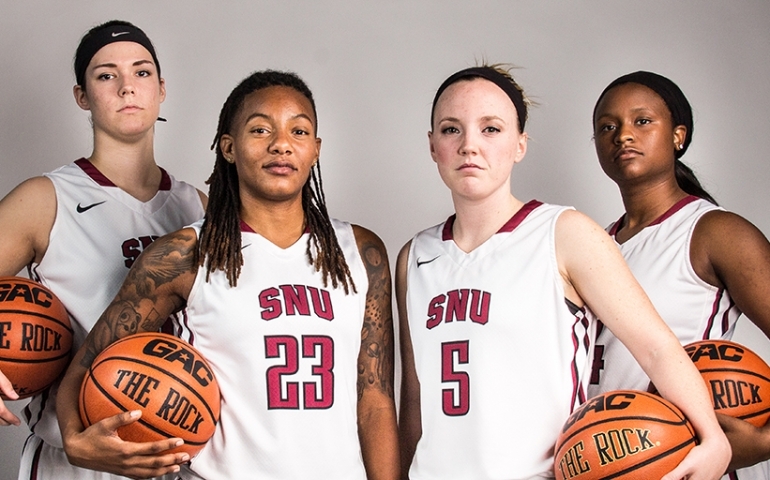 Interestingly, each of them noted that the familial bond among teammates has not only made their SNU experience a more enjoyable one but also helped them grow and mature. This team embodies “Character, Culture, Christ” and the true spirit of this institution. #RollStorm.